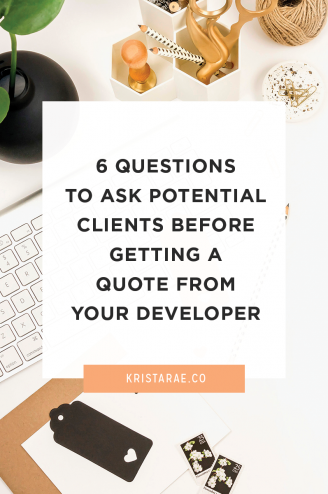 Q: Does the developer need direct contact with my client? Or can all communication go through me? A: This depends on the preferences of you and your developer, but generally you’ll find that all communication will go through you. That way, you have more control over the project and don’t have to worry about information being lost. 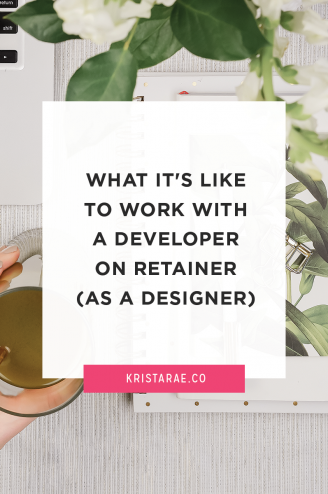 Doing it this way also creates a better experience for your client who may not even understand why a developer needs to be involved in the first place. Read all about how communication works in this blog post. Q: What should I expect my developer’s timeline to look like? A: This will depend largely on the size of your project. For a general website build with a blog and 3-4 pages, one month is a fairly common timeline. 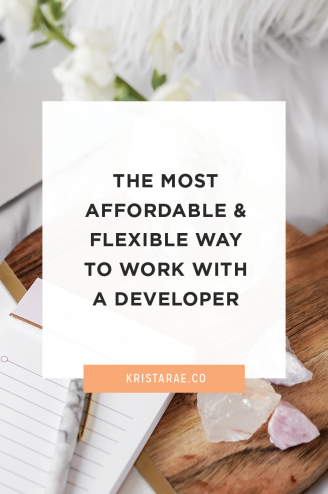 This allows your developer time to get all the details right as well as give you a couple rounds of revisions without being rushed. Remember, for your developer to meet the timelines you’ve agreed upon, you’ll need to provide them with all the mockups, brand assets, and client content by their start date. If you feel like development should be completed much faster, check out this post on why a custom website can’t be developed in one week (and done well). Q: How far in advance do I need to book a project? A: You should be in communication with your developer right when you get a project inquiry. This way, you can work with them to craft a proposal that includes their quote and timeline right along with yours. Getting in contact early also gives you a better chance of getting in their schedule when you want to, rather than having to wait for an opening. However, when you do it this way it’s important to know exactly how long your projects take. You don’t want to have your developer all lined up to start on a specific day and then be late with your deliverables. This could cause the project to be rescheduled and some pretty hefty fees to go along with it. 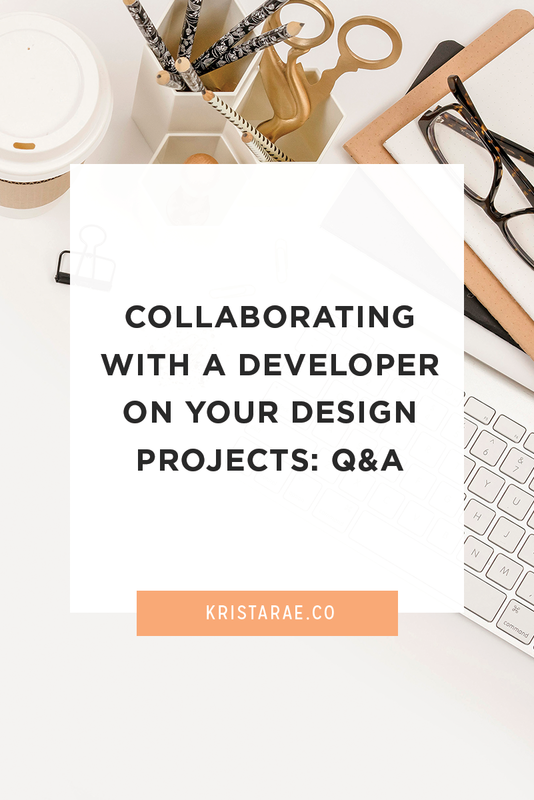 For more details, check out this post that covers important pieces of your design process when partnering with a developer. Q: Should I build the developer’s cost into my fees or does the client pay the developer on their own? A: In the common designer/developer collaboration, you are actually the developer’s client. Because of this, the developer’s costs should be built into yours and you’ll be the one paying the developer. It’s important to make sure you have payments worked out in a way that ensures you get deposits from your client before payments are due to your developer. Read more about managing projects with a developer in this post. Q: How do developers like to be paid? Commission, hourly, or flat rate? A: You can expect your developer to want to be paid at a per-project rate, just like you! Be careful if a developer gives you an hourly estimate on a large custom project. With projects taking anywhere from 40-70 hours, that hourly fee can add up quickly! Q: Can a developer handle the setup of the website if it’s on a platform I’ve never worked with? A: Of course! The joy of working with a developer includes not having to worry about any of the techy details yourself. And that includes website and hosting setup if your client doesn’t already have one. Just make sure the developer you choose to work with has experience with the platform your client is looking for. Q: How can I communicate my design vision to make sure the website looks the way I want? A: The only way to ensure the final website looks the way you want is to provide complete, detailed mockups to an experienced developer. Wireframes or general descriptions won’t cut it in this case. Create mockups that look exactly how you want the final website to look. Read more about making sure the final website looks like your mockups in this post. Q: What files do I give the developer? Is there a certain way they want them set up? A: Your developer will need all of your design files and then some. This includes things like mockups, brand files, copy, images, client login information, and more. Developers with experience collaborating with designers will likely have a detailed checklist for you to follow. As for how the files should be delivered and set up, Dropbox or Google Drive are good routes to take. Make sure your files are organized with descriptive names. Include a folder for brand files with subfolders for things like the logo, patterns, and fonts. Include folders for each page you’ve designed including the mockups, copy, images, and brand elements for that page. This is just a start, but for complete details check out the From Mockup To Code Toolkit! Phew! While those are the question I hear most often, I know there are a lot more out there. For more answers check out my Developer Collaboration blog posts, the podcast, or the From Mockup To Code Toolkit. If you still have questions, feel free to reach out through my Contact page or Instagram! 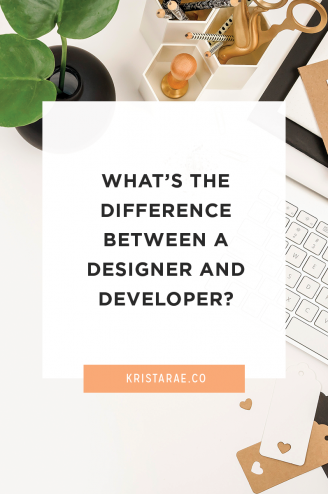 What’s The Difference Between A Designer And Developer?